"There's rosemary, that's for remembrance: pray you love, remember"
Description - Rosemary is a stiff, woody evergreen shrub with narrow dark green, spiky leaves, which are slightly silver underneath, and pale blue flowers. It grows to about 1.5m. Has a sweet lavender-like fragrance. Attributed medicinal qualities - Rosemary is reputed to be good for the following: As a tonic for invalids. To aid the circulation and lower blood pressure. For depression, anxiety and nervous migraines. A cup of Rosemary tea can relieve headches as effectively as an aspirin. As an antiseptic, used externally to heal wounds and internally for mouth infections. To help keep teeth and gums healthy. For strengthening hair; as an aid against premature balding. As a cure for coughs and colds. To soothe bruises, falls and sprains. To help keep you young. To help remove spots, marks and scars on the skin. The Ancient Greeks believed it improved memory, hence that famous line in Hamlet. Greek students would wear a wreath of Rosemary during their exams as they believed it helped their memory by aiding the circulation. And to this day sprigs of rosemary are worn on Anzac Day "for remembrance". Old diggers (australian soldiers) talked of rosemary growing wild on the battlefield of Gallipoli, and how the perfume of its crushed leaves evoked powerful memories. A wreath of Rosemary was worn by brides as a sign of love and loyalty. A Christian legend has it that during the flight to Egypt, Mary threw her cloak over a rosemary bush when she stopped to rest, and the flowers which had previously always been white, turned to blue. In English the word means Rose of Mary, reffering to this legend. It was often used in religious ceremonies to ward off evil and as an alternative to incense. Cultivation - Rosemary requires a sunny, well-drained spot and thrives in sandy, poor soil, which is it's natural habitat. Once established, the shrub is very durable and long-lived. It is often used to create a dense aromatic hedge, but young plants must be protected from frost. Cut back in the autumn. Harvesting, preparation and storage - The leaves can be gathered at any time during the summer, but they are at their best when the plant is flowering. Gather flowering tips in summer and hang in a warm dry place in bunches to dry. Once dried, the leaves should be stripped from the stalk and stored in an airtight container in a cool, dark, dry place. Fresh rosemary keeps well in a plastic bag or a jug of water in the fridge. It is a traditional flavouring for lamb dishes, but can be used with most other meats and fish as well. It is an important component in most combinations of mixed herbs (see recipe below) and is invaluable in any stuffing for chicken or the Christmas turkey. The flowers can be used in salads and as a garnish. 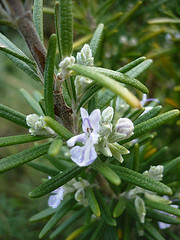 Rosemary is also used as a tea. Magical Uses - Has been used for protection, exorcism and love. Other Uses - As an air freshener. It is very effective as a moth/insect repellent but in the garden is very attractive to bees. An infusion of the leaves has always been popular as a hair rinse. Use the flowering tops and leaves. Culpeper - "It is a remedy for the windiness in the stomach, bowels, abd spleen. and expels it powerfully."